It’s no mystery that I have a soft spot for the chocolate and almond combo and I wish there was more of it around. I mean, this chocolate almond butter spread is awesome and so are these almond butter cookies and these almond shortbread cookies dipped in chocolate, but I want more. 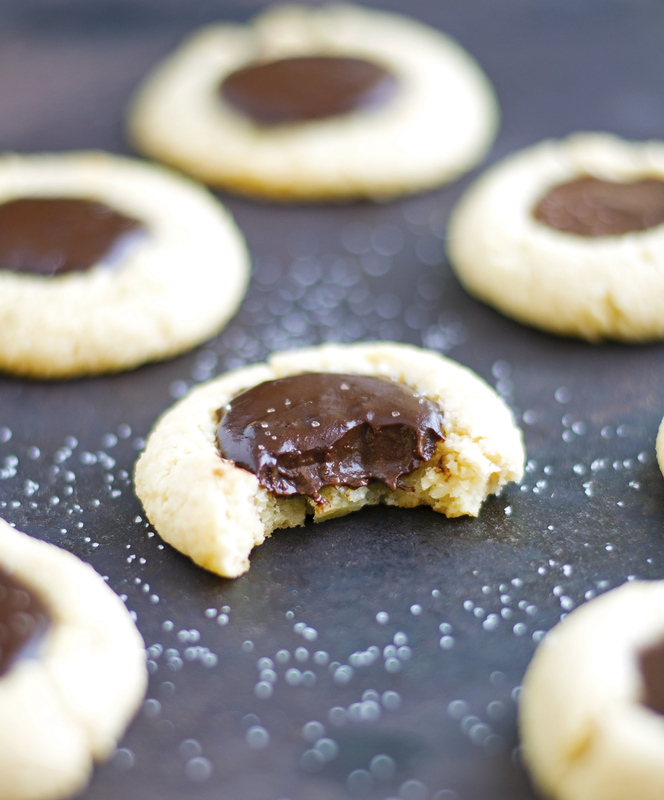 Enter these (Gluten-Free) Almond Chocolate Thumbprint Cookies: chewy and decadently delicious (as every thumbprint cookie should be). 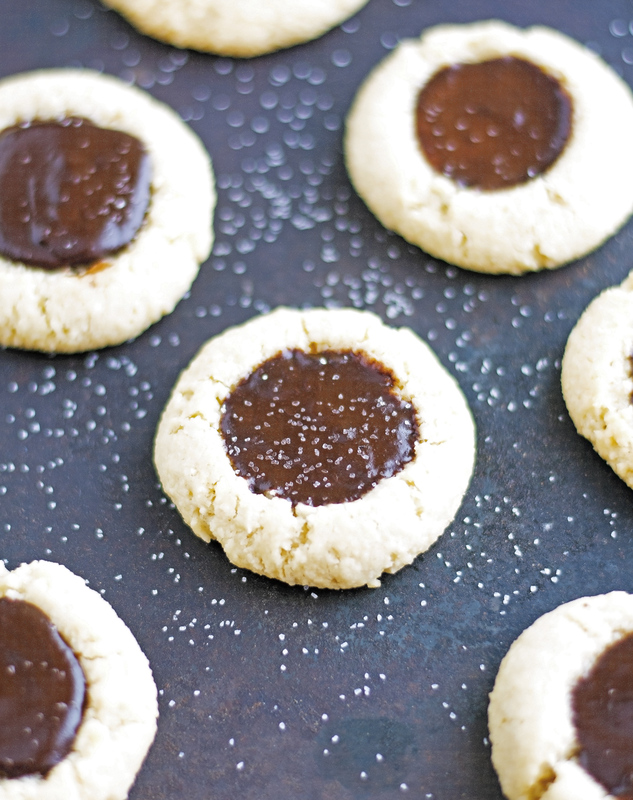 We’ve got buttery-almond cookie bases and sweet chocolate wells of a coconut-chocolate ganache. They’re crisp on the outside and chewy and dense on the inside; the chocolate flavor is extremely pronounced and the cookies are clearly delighted — if taste is any indication — to have chocolate bellies. In other words, a cookie that is destined for greatness. What I really like about this recipe is that you need only 6 ingredients (all easily available in any grocery), they come together in a snap, and they'll be devoured just as quickly. The batter is so simple, you can put it together while the oven is heating. The fact that they are gluten-free, vegan-izable, paleo-fiable, and healthyish is just a happy coincidence. 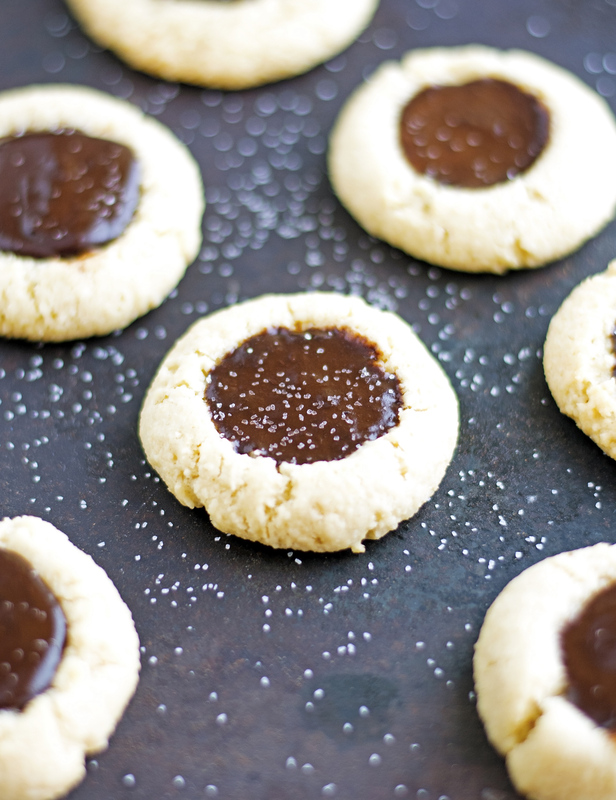 Trust me when I tell you that these Almond Chocolate Thumbprint Cookies are going to be your new Christmas cookie favorite, this year and probably every year. Try these and you’ll see why they’re one of my favorites. 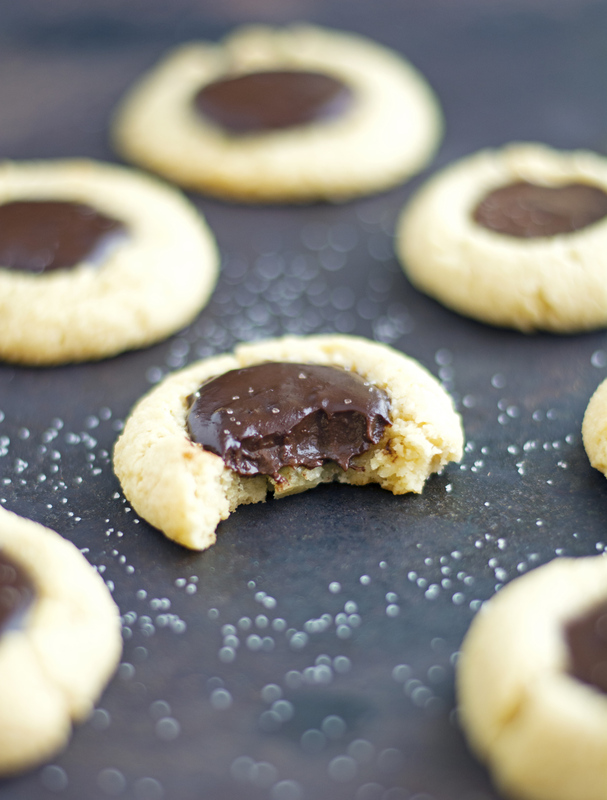 (Gluten-Free) Almond Chocolate Thumbprint Cookies Print this recipe! In a bowl mix almond flour, cornstarch, butter, and maple syrup until a dough form. Scoop 1 tablespoon of dough and roll it into a ball. Place onto the prepared baking sheet and make an indent in the middle with your thumb. Repeat to make 16 balls. In the meantime, melt chocolate chips and coconut milk in a double boiler over low heat, whisking until melted and smooth. When the cookies are done baking and still warm, reinforce the thumb indent, and pour a small amount of the chocolate mixture into each cookie indent. Let cool completely and sprinkle with a bit of salt if you like. One cookie yields 126 calories, 8 grams of fat, 10 grams of carbs, and 3 grams of protein.